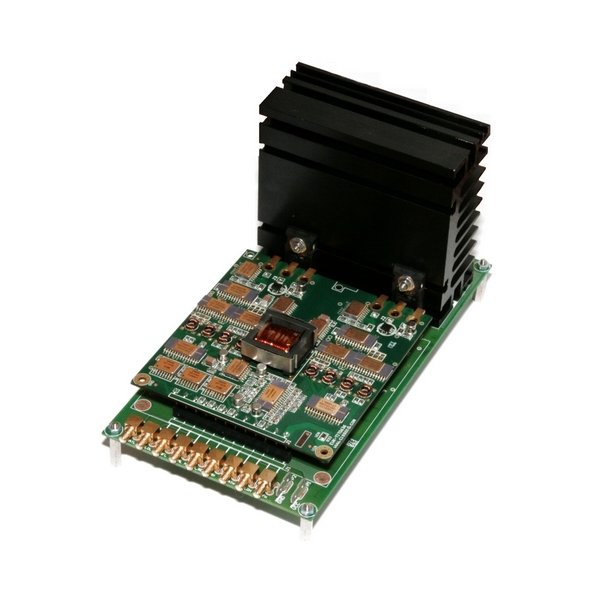 HADES® is a turnkey half-bridge isolated gate driver Reference Design designed for high-temperature, high speed and high-reliability applications. While it has been tailored to support the newest generation of wide-bandgap power switches such as SiC and GaN, the solution is also suitable for driving standard IGBTs or transistors anywhere there is a need to improve the reliability of the systems. With a standard gate current capability of ±4A or ±2A, the solution is scalable up to ±20A, while supporting a bus voltage up to 1200V. Delay time (PWM to NGH/NGL)): 200ns typ. Rise time (on a 1nF load): 10ns typ. Fall time (on a 1nF load): 10ns typ. A product brief for EVK-HADES is available for download (see above). The application note is available on request: Request EVK-HADES application note. The Evaluation Board EVK-HADES® can be used immediately to implement a power converter or a motor drive, supporting a bus voltage up to 600V/1200V and gate currents up to ±2A (SemiSouth normally Off JFETs) or ±4A (Cree MOSFETs) . The two channels (high and low-sides) can be controlled independently of each other or used in a half-bridge configuration. In the latter case, the EVK-HADES board in combination with external power switches can form a complete 1-leg inverter solution for immediate evaluation and testing. The Reference Design is based on the chipset CHT-THEMIS / CHT-ATLAS and CHT-RHEA. The solution also includes an isolated power supply built with CHT-MAGMA PWM controller. For applications that require greater gate currents, designers can modify HADES® Reference Design and build their own board by adding up to 5 additional CHT-ATLAS circuits per channel (high-side and low side) in order to source / sink up to +/-20A to the gate of the power switch devices. The board EVK-HADES is populated with CISSOID integrated circuits in ceramic package form (CSOIC28), guaranteed for -55°C to +225°C. The board is based on a polyimide PCB (rated 200°C). The passive components and the desaturation diode allow operation up to 175°C, with possible short excursions to 225°C for testing. The evaluation board is delivered with the complete electrical schematic, the bill of materials including active and passive components, the Gerber files.